Forged Versus Billet Pistons: Which One Is Better? Piston Technology: Is Forged Or Billet A Better Piston? Don’t be misled into believing there are significant strength benefits to using billet pistons over forged versions. That’s not the primary motivation for the growing interest in billet pistons. Instead, it’s simply time management. The undercrown structure is normally created in the forging of a piston. 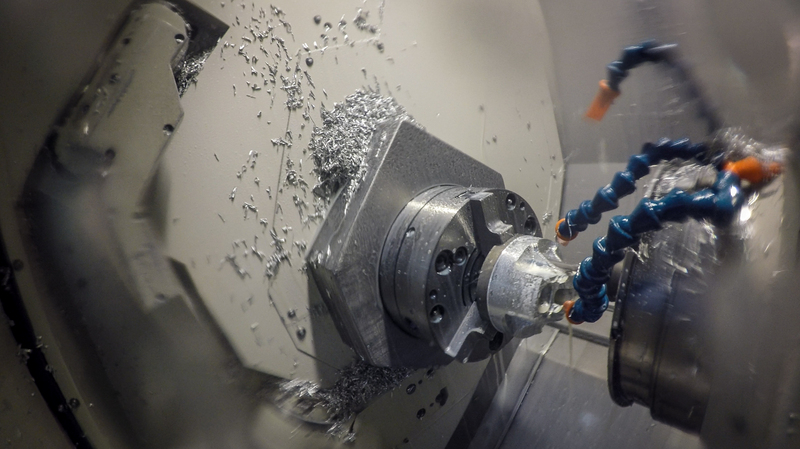 For billets, those features are machined into a billet puck of aluminum. Here you can see the undercrown profile taking shape on a billet piston. Leading professional engine shops that serve Formula 1, WEC, NASCAR and other premier racing venues have long used in-house CNC machines and lathes to produce pistons for development purposes as well as race engines. New prototypes can be in the assembly room and on the dyno for testing in a day or so after engineers finish their design and FEA simulations on the computer. Which begs the question: What kind of piston design changes require the turnaround time that billet offers? A single JE piston forging can be used for a variety of engine applications. After forging, the pistons are heat treated and tumbled before heading to the CNC. 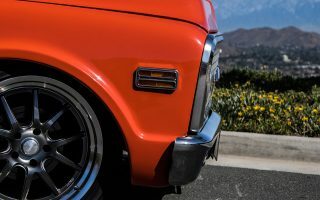 The debate over forged versus billet isn’t quite as heated within the piston community as it is in crankshaft market, but many of the arguments are similar. “A forging, in general, will be stronger than a billet for a few reasons. Typically, a forging will have a better grain structure and thus more consistent material properties” says Stothers, noting that both go through similar heat-treating processes. “So the strength will be similar but the forging will edge out the billet because of the hot-forged method. There are more alloys to choose from when designing a billet crankshaft, so the strength arguments there could depend on metallurgists’ conclusions and quality controls in the forging operation. 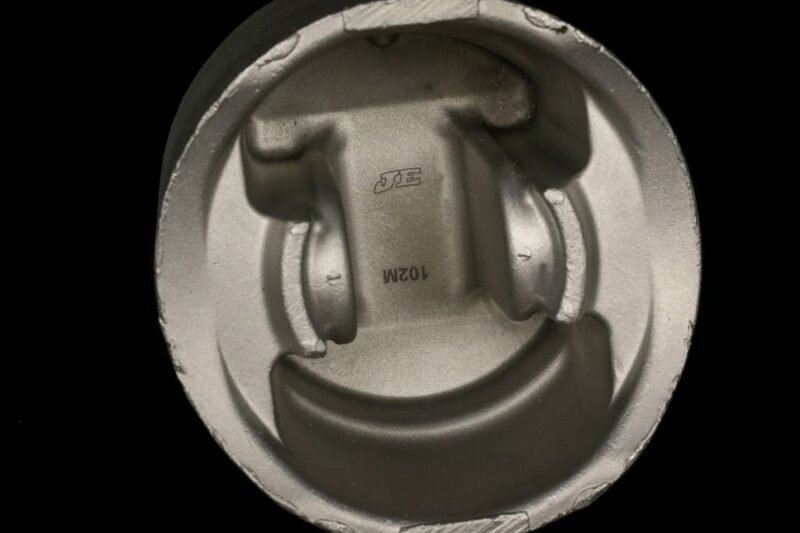 While exotic aluminum alloys are found in engine shops not confined by rules, most performance forged and billet pistons are produced from 2618 and 4032 alloys. “We have experimented with all kinds of alloys, including MMC, but we typically stick with 2618 and 4032. These prove to work in most applications, are relatively cheap, and machine very well,” adds Stothers. A fully machined undercrown is a common sight for a billet piston. This application also features an assymetrical skirt design. MMC stands for metal matrix composite, which is about 15 percent lighter than aluminum and offers a higher ultimate tensile strength at higher temperatures. However, production of a MMC piston is much more critical and difficult, not to mention more expensive. The main difference between 2618 and 4032 is the silicone content, with 2618 consisting of less than .3 percent silicone and 4032 measuring about 12 percent. The extra silicone in 4032 reduces heat expansion and is great for wear resistance and overall durability. That makes it preferable for most street and moderate performance applications. On the other hand, 2618—which was originally developed by Rolls-Royce for the Merlin aircraft engine—is more malleable and will flex before fracturing under very high cylinder pressures. While overall strength is a little higher with 2618 and it will withstand the shock loads of detonation better, it will distort more rapidly. Therefore, 2618 is favored in extreme racing applications where regular servicing is scheduled. JE offers billet and forged pistons in both 4032 and 2618 alloys, although most of the performance applications require 2618. One aspect of design that forged and billet pistons have in common are their fully machined domes. Pistons that require a large dome due to high compression may need to be billet due to the overall height of the piston. JE uses different forging methods to produce the initial slugs before machining. The company has two mechanical presses—1,000-ton and 2,000-ton—and two hydraulic presses. Both presses are isothermal, which means the forging process keeps the work piece at the optimum temperature—generally around 700 to 800 degrees F—by not only heating the metal but also the die, as well. Since heat from the work piece doesn’t transfer to the tooling, the flow characteristics and grain structure of the forging is improved. Sometimes billet piston undercrowns are blasted to remove sharp edges, which can improve fatigue strength. There are few differences in the development and machining processes that would give a performance edge to either forged or billet. Both are tested virtually in FEA programs, and both are machined on identical equipment. Typical features like the pin hole, ring groves and crown milling are the same between billet and forging. Since coatings adhere to machined surfaces, neither has an advantage in surface treatments. “A billet will give you more dimensional accuracy over a forging because of how precise a CNC machine is,” counters Stothers. “While a forging can have nice smooth transitions because of how the tool is created, but they may not hold the same tolerances as a billet could. 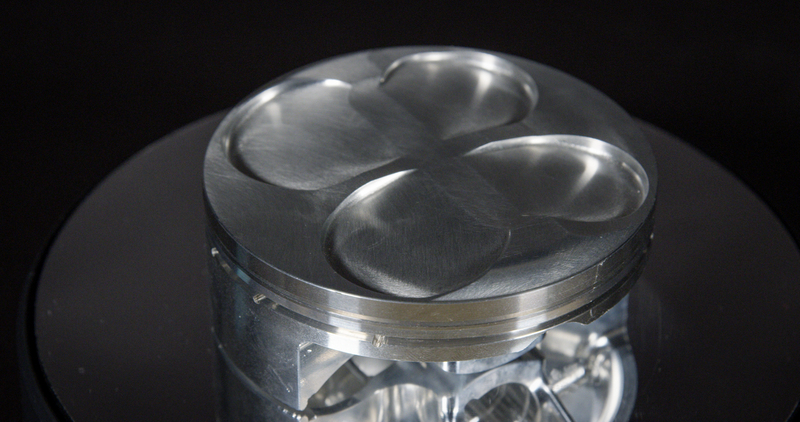 While the differences aren’t huge, a forged piston is still stronger than a billet. Typically, a forging will have a better grain structure and thus more consistent material properties. As engine tolerances become more critical and designers experiment with different crown shapes to optimize diesel and direct injection applications, billet pistons will be in demand to shorten turnaround time in race shops. There’s even been discussion that one way to equally balance all the cylinder pressures is to design pistons specific to each cylinder. Is 3D Printing a Piston Possible? JE can 3D print pistons but in plastic form to help validate custom piston clearances ahead of running a full set of billets. Piston manufacturing starts with slugs formed either by casting or forging, or from a solid billet blank. Another way to produce a slug is through 3D printing, or more accurately known as direct metal laser sintering (DMLS). 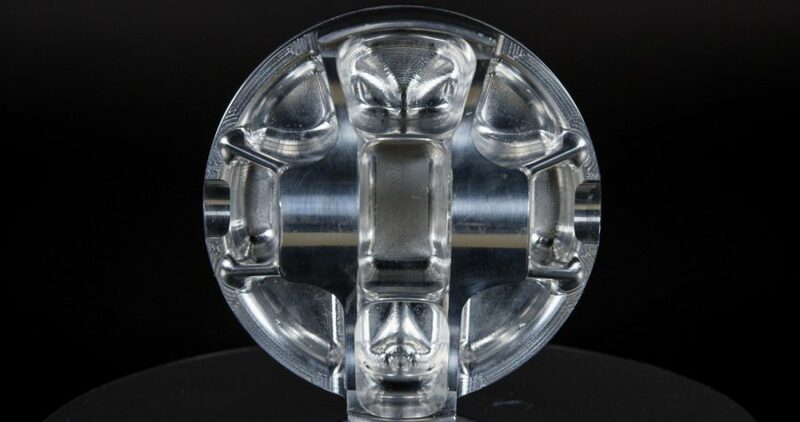 This process uses a laser to melt very thin layers of powdered metal on top of each other, allowing extremely intricate designs such as internal cooling passages. 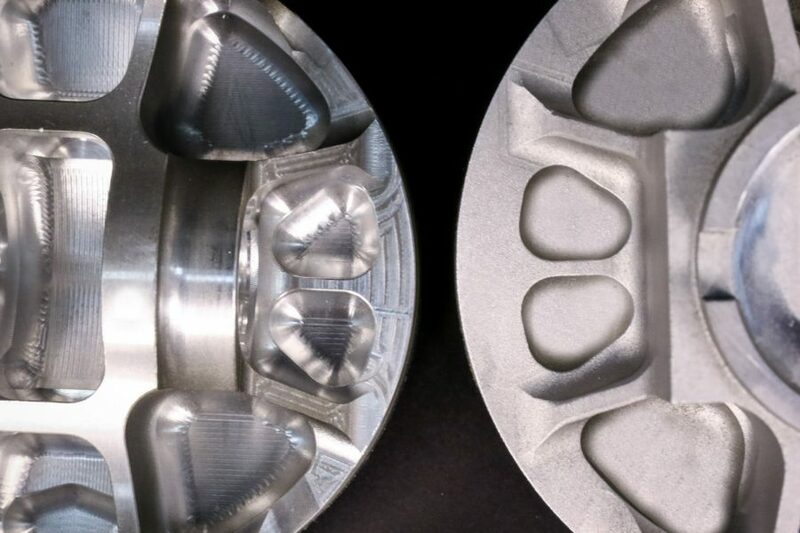 There are engine designers who have used 3D printing for piston prototypes in low-pressure applications, and machining is still necessary to complete the part. 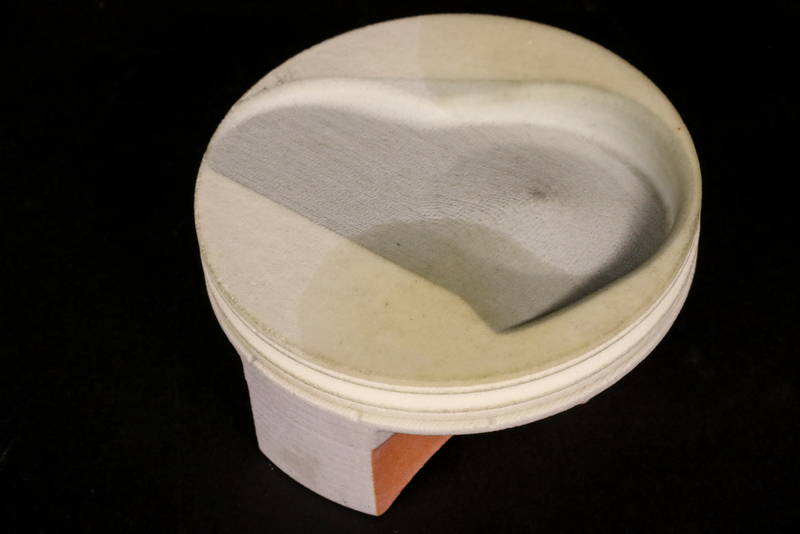 “3D printing has come a long way but the cost-to-benefit ratio for pistons in our industry just isn’t there yet,” cautions Clayton Stothers of JE Pistons.